On March 15 and 16, 2018, I introduced you to an amazing product, Stitch-N-Steam by UNIQUE. 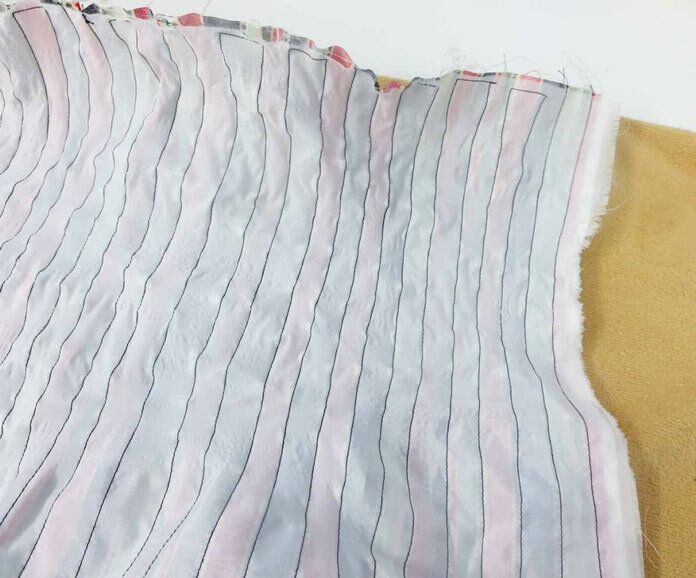 The package contains 1 piece of polyester fabric 18″ x 62″. Stitch-N-Steam is a steam activated product, designed to add texture to the fabric. After steaming, fabrics will shrink approximately 30%, giving the fabric a wonderful textured effect. Be sure and go back to read those QUILTsocial blog posts if you missed them before. At the end of those blog posts, I showed you a picture of a tote bag that I had made, using Stitch-N-Steam to create the textured pocket. Here are the instructions for making this bag. Pin the Stitch-N-Steam to the wrong side of the outside pocket fabric and then start stitching. 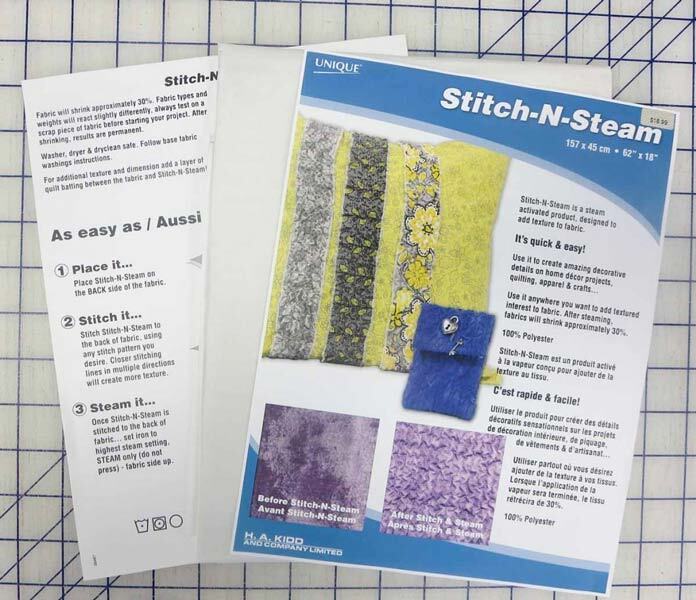 You can stitch on the Stitch-N-Steam or on the fabric you want to texturize. You can draw a grid as a guide for stitching or just use the width of your sewing foot or a design line on the fabric as a guide. 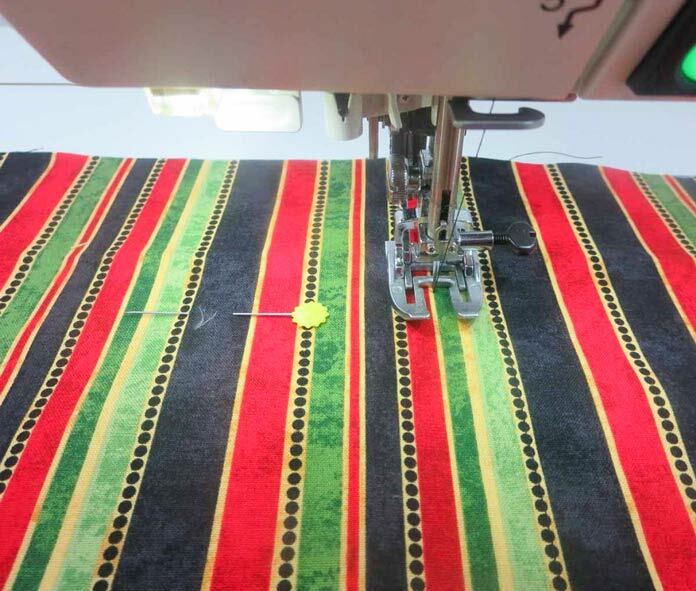 You’ll get the best results by stitching lines about ½” – ¾” apart. 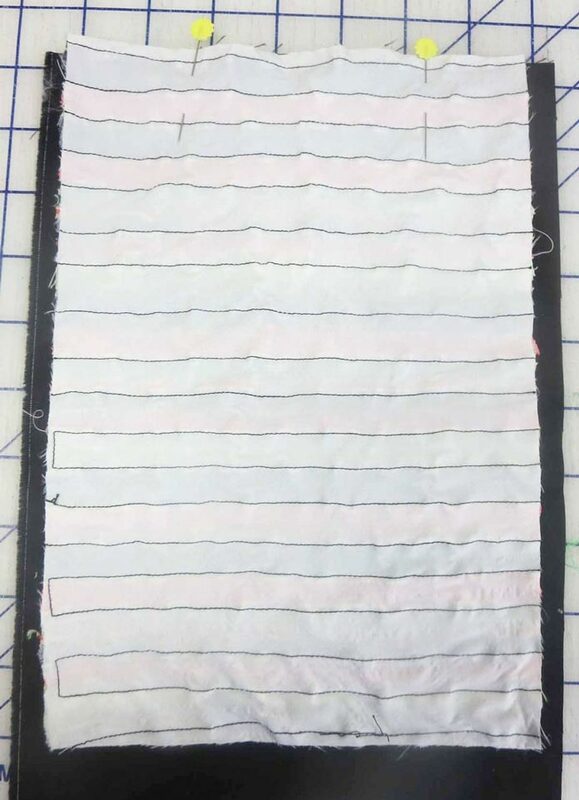 Because I was using a striped fabric, I stitched along the lines of the stripe. Stitch on the fabric design lines through the Stitch-N-Steam on the back. After the stitching is done, apply steam from your iron to the Stitch-N-Steam and then the magic happens! Don’t let your iron touch the fabric – just hold it about 1″ above the Stitch-N-Steam and watch the texturizing start to appear. After steaming, the Stitch-N-Steam looks like this. 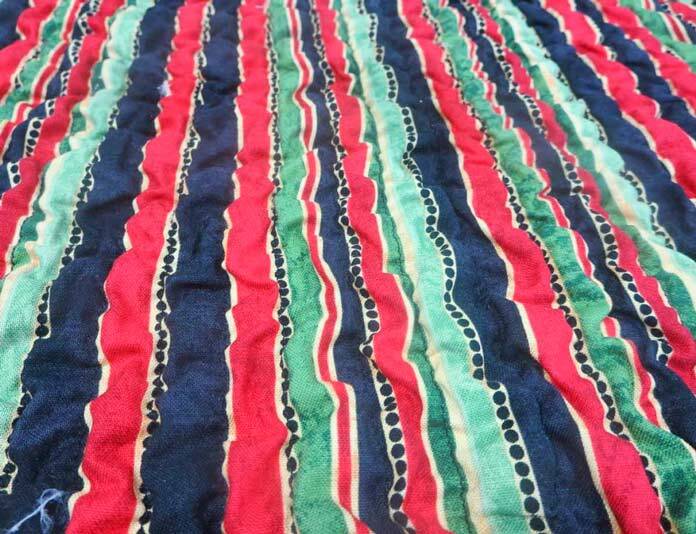 After steaming, the fabric on the front looks like this. Layer the outside pocket and the pocket lining, right sides together. Make sure the lining is centered over the pocket. Stitch across top of pocket lining using a ¼” seam. Make another pocket in the same way. Stitch across top of pocket and lining. Turn the pocket right side out, leaving ½” of lining showing as a border across the top. Top-stitch through the seam line. Machine baste the raw edges together. Trim so that all layers measure 7″ x 11″. 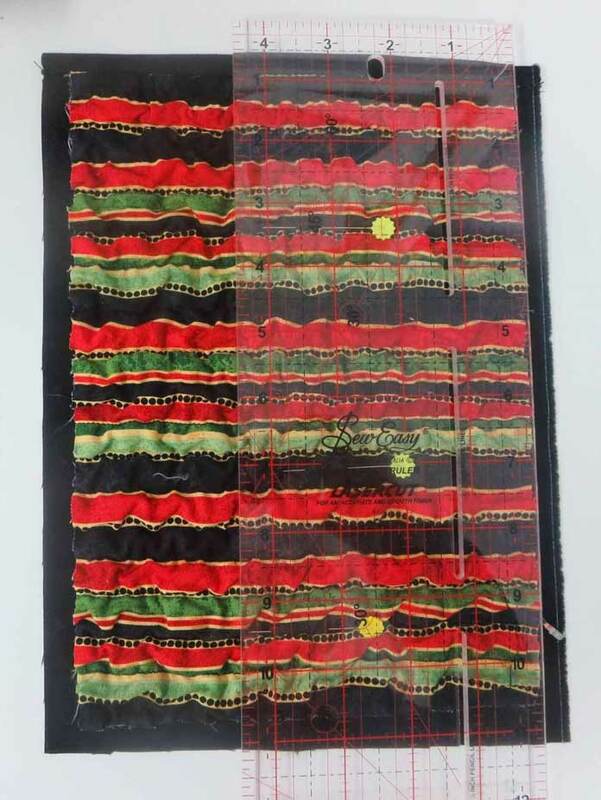 Trim pocket so all layers measure 7″ x 11″. 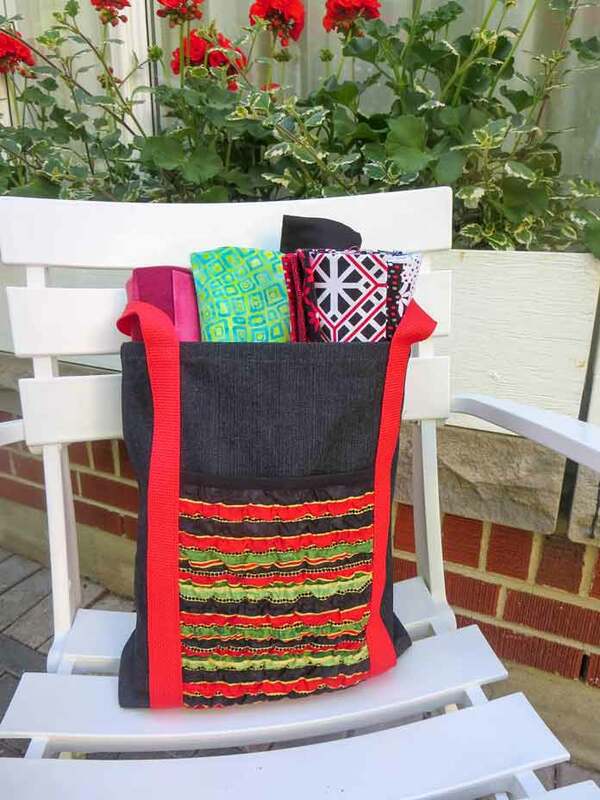 Come back tomorrow and learn how to make the inside pockets and use the Stitch-N-Steam texturized pocket to finish the outside of the tote bag!